Last week I ran one of the best programs that I’ve ever done, at least in my opinion. And I took pictures, so you get to see all of it’s glory. The program was ‘Teen Iron Chef’ which I had heard about but was nervous about actually presenting. It sounded like a lot of work: buying enough food and ingredients, making sure that I could get registrations, worrying about food allergies, worrying about mess. I worry about a lot of things. But I read posts about the program on two lovely blogs, Green Bean Teen Queen and Creative Library Programs, and decided to give it a whirl. I spent about $30 for the food but there was hardly any left by the end! 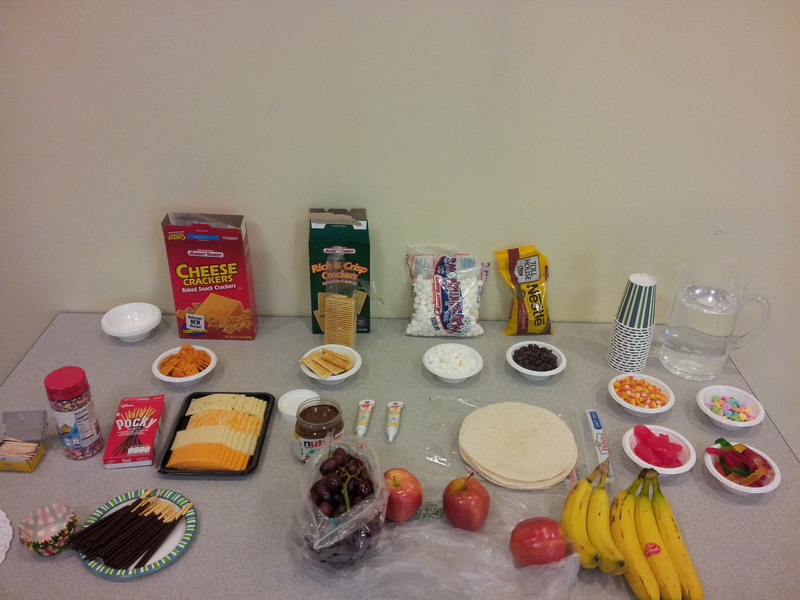 I assembled it all in our program room and set up plates and supplies for the teens. I brought in cutting boards and a few sharp knives (the rule was the knives had to stay on the cutting board and not be taken around the room, so as not to stab anyone). I also had toothpicks, cupcake papers, plates, napkins, silverware, and some cute gelato bowls to use for assembly and display. 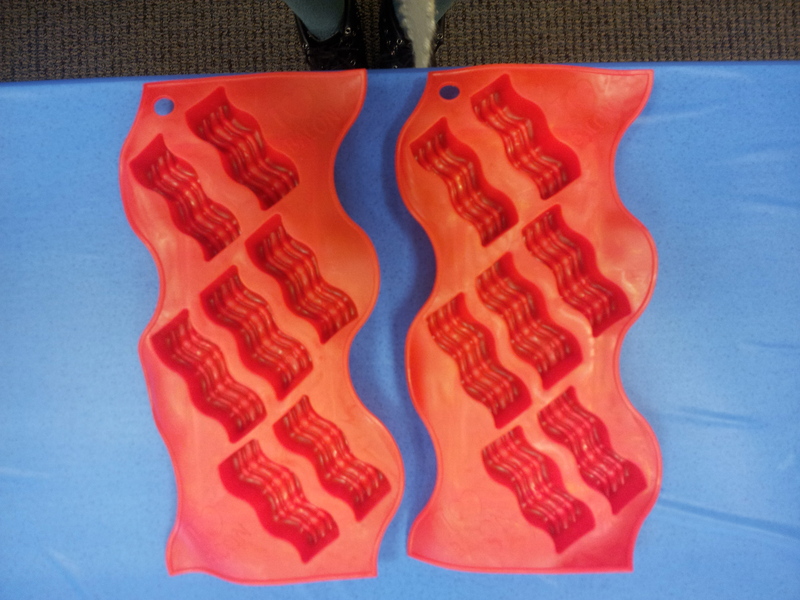 For the winning team, I purchased these hilarious ice cube trays that make bacon-shaped ice cubes because . . . because . . . well, because they make bacon-shaped ice cubes. And they were $1 each at that magical source of stupid prizes: the Target Dollar Spot. Only a few of the teens were excited about these, I’m not sure why. I had the teens get into pairs, pick team names, and then get their ingredients. I left them get as much stuff as they wanted and had them get more during the assembly if they needed it. I wasn’t about to be super annoying about it, and I wanted them have fun. (I’m kind of a programming push-over: I basically let them do whatever.) 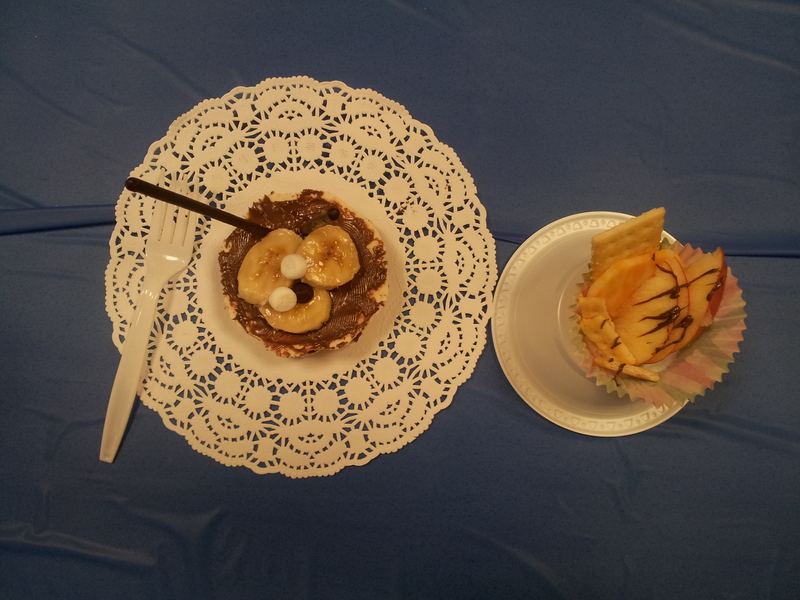 After 30 minutes, each of the teams presented their snack and dessert to Amy, a willing Children’s librarian, and myself. Take a look! 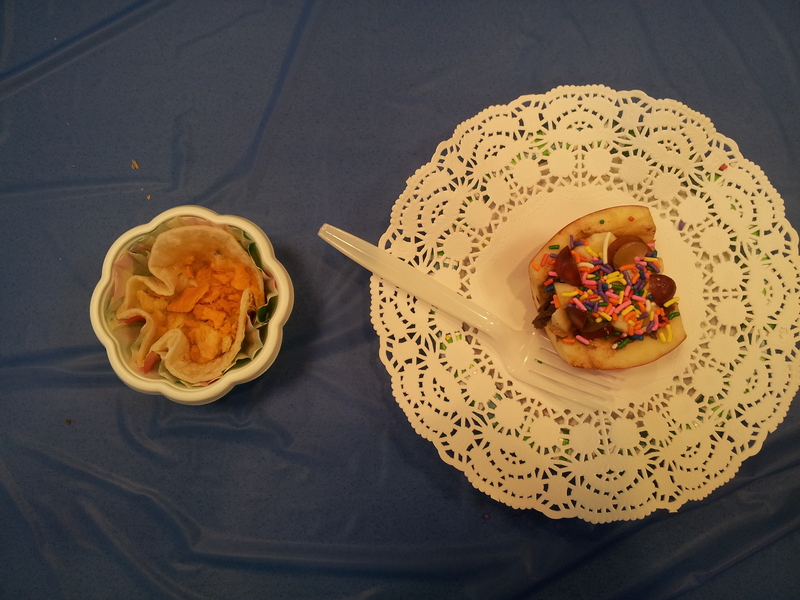 Team Nemo – The snack on the left is a ‘deconstructed quesadilla’ aka melted cheese in a tortilla with crushed cheeze-its on top. Needless to say, it was delicious! 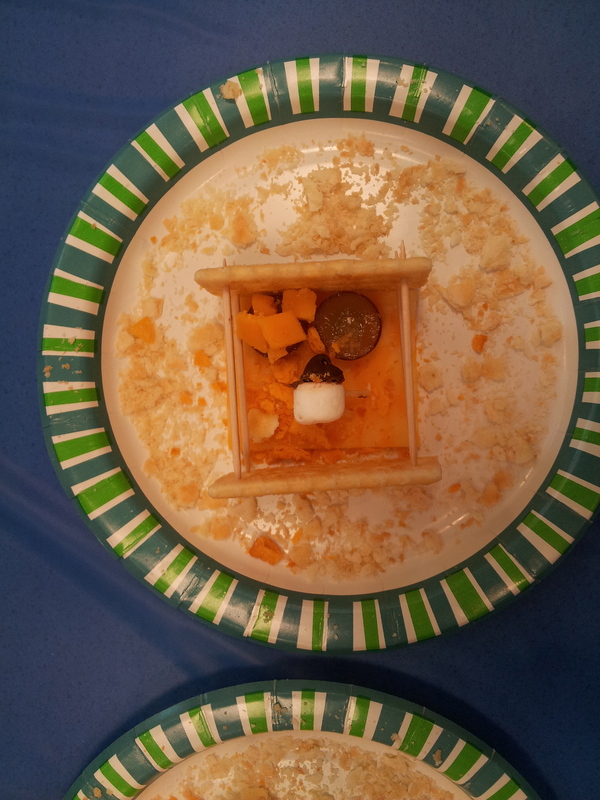 Team Zombie – It’s hard to tell, but this is actually a tiny marshmallow and chocolate chip sheep in a pen! So cute and creative! 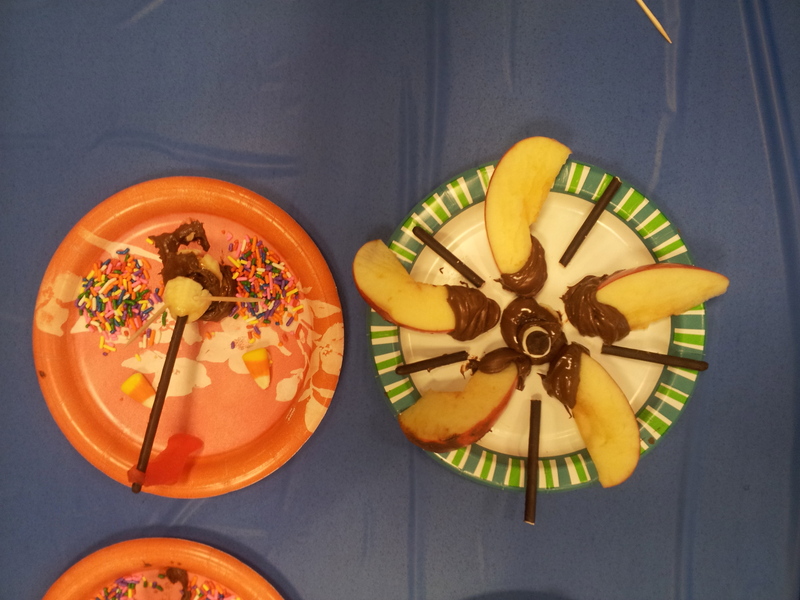 The Dynamic Dicers – The dessert on the left is a fishing scene with Pocky as the pole and a speared Swedish fish! The Baking Beauties – Cheese and cracker classic. I could eat that all day. The Platinum Chefs – The winners! 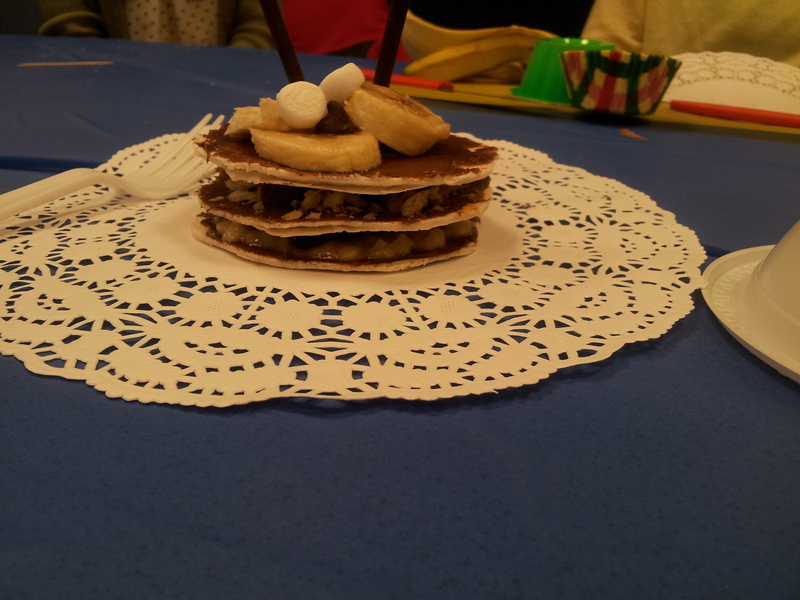 A better view of the Platinum Chefs’ dessert: layers of tortilla, nutella, and banana. Yum! I had a great time and while with 10 people it wasn’t the best attended program I’ve ever had (both my Hunger Games parties had 25-30 people which is a HUGE amount for me), it was definitely one of the most fun. 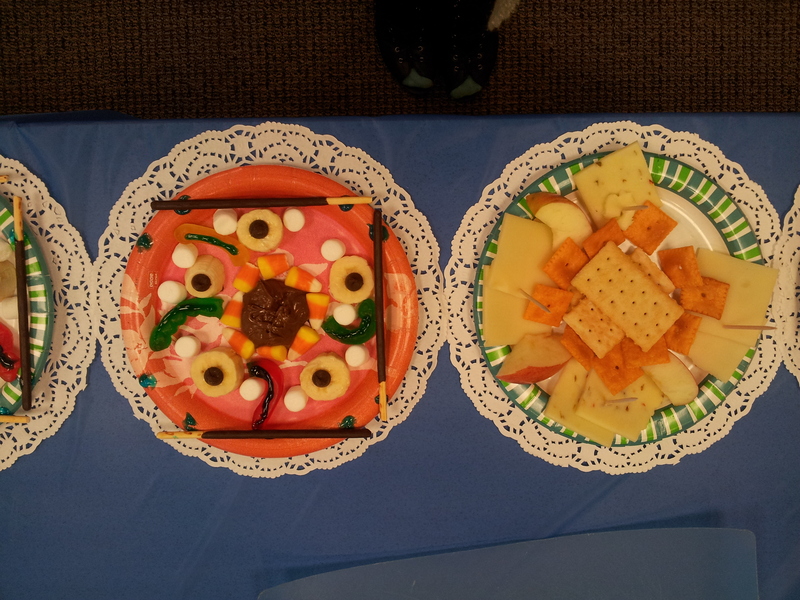 The teens were so much more creative than I would have been and they worked really hard. It’s a little bit of work to set up but really worth it. Luckily, none of my teens had any food allergies so that made it easier. If I did it in the future, I would make sure to have another ‘glue’ instead of Nutella in case of nut allergies. It’s programs like this that make me feel a bit better about programming. I’ll admit it’s not my favorite part of the job because I get so stressed about whether or not people will show up. Or that I don’t have enough things planned to do; I’ve found that my patrons like a plan or a structure to the programs. Too much freedom and they get nervous! For the summer, I do have some great programs planned that I hope will go well: a henna program, a visiting ghost hunter, a ‘CSI’ program with a former MA state detective, a scavenger hunt, making time capsules, tie dye, a pottery demonstration and hands-on program with the Children’s department, making garden mosaics stepping stones, a City of Bones program to coincide with the movie release, and a few more things I can’t remember. It’s going to be a great summer! Do you mind me asking what your YA programming budget for the year is? Is that budget it’s own line item? I don’t have my own YA programming budget. I have to take the money from Children’s budget and it makes planning hard because I don’t have control over the management of it. This program sounds really fun & I would love to give it a try! I just had a Divergent book club with trivia and it was really successful. If Hunger Games is popular with your teens, I suggest trying Divergent! I can pass along my trivia questions if you’d like. I have about $1000 which is SO amazing. Even with some money, I have found that you can still do a lot with a little . . . it just takes a lot of work and planning. Can you also try and share programs with other departments? Like have a class that’s open to teens and adults? I’ve been wanting to do with a graphic novel class with my adult services department (Andy Fish, who costs around $400 for an hour and a half – something I still can’t stand paying by myself.). And yes, I need to get on the Divergent bandwagon! I would love your trivia questions if you want to share: atschetter@mvlc.org. Thanks!